Introducing a wide collection of amazing and most attractive eagle logo templates. Eagle is the most powerful bird that can fly high in the sky. Most of the brands especially like sports, gadgets, travels aspire to use an eagle in their logos. Not only them but also many rock music group bands also wants to integrate the eagle logos with them. Eagle is the epitome of strength, leadership, vision and speed. Eagle logo is perfect for those who have a go-getter attitude and are hungry to taste the success. 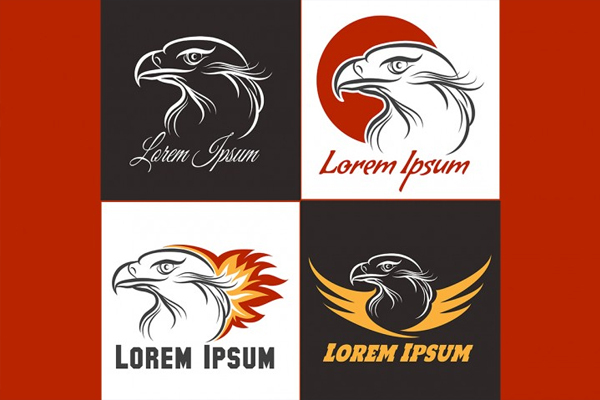 So, if you are one among them then a logo based on an eagle is an ideal choice for your organizations. All you need to do is add your own logo, design, edit colour, or adjust the background texture, you can also change the color gradients and design using via smart object easily. Download the best design from a wide range of eagle logo templates available for free and premium versions.